On these hot summer days, it’s easy to find a frosty treat plopped atop a cone or packed inside a carton calling itself ice cream. But to savor the genuine stuff, hand crafted with all natural ingredients, it takes some searching. Mid-Shore ice cream purists don’t have far to look, though, thanks to Nice Farms Creamery in American Corner near Federalsburg and Scottish Highland Creamery in Oxford. Bob Miller’s Nice Farms Creamery, begun in 2009, was inspired by the farmers he encountered while serving two tours of combat duty in Iraq. Victor and Susan Barlow, Scottish Highland Creamer co-founders, began their personal and professional partnership in Edinburgh, Scotland. Nice Farms’ tagline “From Cow to Cup” essentially tells the story: Forty or so pasture-grazed dairy cows, from breeds specially selected for grass foraged diet success are milked twice a day to deliver the main ingredient which is then pasteurized on the farm. All flavor mixes are handmade from scratch, Miller added. Only cane sugar is used. Nice Farms’ ice cream contains 15-16 percent butterfat, higher than the standard 12 percent, he said. By using pasture-fed cow’s milk rather than grain fed, there’s also more of the healthy fat, conjugated linoleic acid, or CLA — a potentially cancer fighting substance. Also, the dairy’s milk has a yellow hue to it, reflecting increased amounts of beta carotene from the cows’ grassy diet. Tucked far off the main roads, Miller’s worked to bring the ice cream to people, but there is an on-site store open 3 to 6 p.m.(or by appointment) for ice cream container purchases. Nice Farms’ website, nicefarmsmd.com, lists a growing number of area farms, markets, businesses, and eateries stocking its products. Among the most recent is landmark Easton restaurant Mason’s Redux, which added “Nice” cream to its new dinner service menu. A refrigerated truck Miller adapted specially for creamery road trips to farmers’ markets and other functions has attracted an enthusiastic following during its year-round Tuesday afternoon stops at the Camden Avenue Farmer’s Market in Salisbury among college students and families, with hand-dipped cones and malted milkshakes. 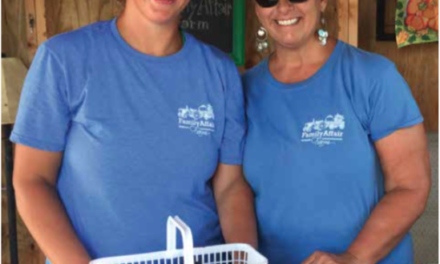 (Nice Farms Creamery also appears weekly at the Kent Island Farmers Market in Stevensville (Thursdays afternoons), the Anne Arundel County Farmer’s Market in Annapolis (Sunday mornings) and the Historic Lewes Farmers Market in Delaware (Saturday mornings). At events like Tuckahoe Steam and Gas Show, Eastern Shore Thresherman’s Show, and Wicomico County Fair, Miller usually showcases large authentic churns powered by a revamped classic John Deere engine. A Salisbury University history major, Miller is the product of farming families: His grandfather Leon Nice, the creamery’s namesake, and parents Bob Miller and Chase Tanner. Miller credits them with envisioning a pasture-grazed dairy farm as the healthiest option for cows, people, and the land itself. They moved to the present 201-acre location in 1989 from Bordentown, N.J. Son Bob now helms the team, assisted by wife Jaclyn, daughter Brandi, brother Lucas, and youngsters Jake and Jacob, the primary taste testers, Miller said with a laugh. Nice Farms Creamery is one of the three Eastern Shore Dairy Farms selected as Maryland Ice Cream Trail official stops statewide. (Others include Kilby Cream in Rising Sun, Chesapeake Bay Farms in Pocomoke and Berlin. The creamery also received the 2017 Bright Lights award for Caroline County, recognizing innovative practices and partnerships benefitting the state’s economy. Instead of cows, boats dot the scenery outside Scottish Highland Creamery’s waterfront window in Oxford. Customer seating is limited to the outside deck only, with the building’s inside devoted to mixing up hand crafted recipes a gallon at a time. As a youngster in Edinburgh, Victor Barlow lived above an Italian ice cream shop, Mr. Boni’s, that dated back to 1907. He began working there at age 15, eventually becoming manager, and the only person outside the owner’s family to be entrusted with the handed down recipes. A frequent visitor to Scotland, Susan met her future husband and brought him to the United States in 2001. The couple’s current location at 314 Tilghman Street for over a decade now is their second Oxford shop; the first gave way to a detoured foray to Georgia then a return to Maryland, but outside the ice cream trade. Realizing that ice cream was her husband’s calling, when the current site became available, Susan closed the deal without his knowledge, raising his ire. But with his strong Scottish work ethic and innate ice cream artistry, the move paid off. She said with the creamery’s attention to detail, quality of ingredients, and a dedicated team of “super scoopers,” the shop has many loyal customers and gained rave reviews and accolades unusual for a small town establishment of its size. Today, they’re regularly ranked among top ice cream regionally and across the United States. Asked which flavors are most popular, Susan said their Italian lemon cookie has achieved an almost cult-like following, but that any of their coffee flavors — there are 15 or 20 variations — is hands down the biggest crowd-pleaser, surpassing even chocolate. “The few rare times we’ve run out of coffee ice cream, people will accept no substitute, she said. The Barlows credit their enthusiastic staff with supplying new flavor ideas, but they’re also inspired by noteworthy events such as Lemon Elderberry for the recent royal wedding, plus Red Hot Cinnamon for the Washington Capitals winning the Stanley Cup. Six years ago Susan created a patriotic specialty offered only on the “red, white, and blue” holidays of Memorial Day, Independence Day, and Labor Day, she said. The blend combines mascarpone clotted cream, blueberry pie filling and fresh red raspberry. The creamery’s refrigerated cart is available for community along with personal and family celebrations such as birthdays, weddings, and even funerals. Some local folks have included a request in their will for the cart’s appearance at their final send off, Susan said.